Questions, comments, suggestions and complaints are all welcome. Please include the URL of any page you refer to. If the website seems not to function at all, please contact info@aodn.org.au, noting that our systems are not monitored 24/7 (being research infrastructure rather than operational). Apple has withdrawn support for the Windows version of Quicktime, the movie player that we use and recommend for the fli-format animations that we produce. This is because of the security vulnerability described by [Christopher Budd of Trend Micro], prompting calls for Quicktime to be uninstalled immediately from Windows machines. What to do? Firstly, note that Christopher said "Both vulnerabilities would require a user to visit a malicious web page or open a malicious file to exploit them" so it's still safe to use Quicktime to view content produced by us. But still, you or your IT department may want to uninstall Quicktime so you don't accidentally use it while browsing off-piste. We will either 1) find another viewer for our existing archive of .fli files, and/or 2) find a better way of converting our animations to better-supported formats. We have tried both these options in the past, but not to our complete satisfaction. We'll keep you posted. Suggestions are welcome. David dot Griffin at CSIRO dot au. 13 July update: we will gradually provide more animations in mp4 format (e.g. see latest seaglider deployment in GAB). We have switched to using PowerFlic for viewing the existing archive of fli animations but make no assertion that it is safe for others to use. Precision-orbit altimeter observations of sea level, which began in 1992 with Topex/Poseidon, are set to continue. Jason-3, the fourth altimeter in the series, was successfully launched from Vandenberg Air Force Base in California yesterday at 18:42 UTC. Initial telemetry reports show that all systems are in excellent health. The final orbit will be reached in 18 days with the beginning of cycle-0 on February 4, at which point members of the Science Team (including ourselves) will start to assess the accuracy of the data. The observations will initially be coincident with those by Jason-2, for comparison purposes. Jason-2 will later be moved into a tandem orbit, filling in the gaps between the observations by Jason-3 in order to maximally improve maps of sea level and surface currents such as the ones made by us. More: [CSIRO sea level team site]. We are now showing the location of Australia's new Marine National Facility, RV Investigator on whichever of our small-region plots she happens to be in. Current velocity data from the Acoustic Doppler Current Profiler is also shown, as well as her measurements of sea surface temperature, or chlorophyll, as in example 1 at right. To see the details of her track and observations along with whatever else you want to view using Google Earth, e.g. IMOS SST and geostrophic currents, gliders, etc, use this kml file (v2), to see, for example, the current velocity averaged from 30m-80m depth, as shown at right. We've been working for months towards the goal of having all the IMOS mooring, glider and radar data included on the high-resolution plots of the recently reprocessed SST and Ocean Colour data (as well as the Argo and other data already there). The job is now finished for 2004 onwards. Some statistics (gleaned today from our revision-monitoring tool): there are 679,562 individual SST images and 82,545 ocean colour images. Few people will want to click through so many, especially since clouds spoil most of them. So we've done two things to speed up the viewing process: 1) string them together into animations, and 2) create galleries of the best images, based on our estimate of the cloud-free fraction. These can be reached via the Date Selector once you have chosen a region. A few ocean colour images from the galleries have caught our eyes. Two are discussed in today's news item. A third, in the Great Australian Bight, puzzled us. Is that wave-train pattern near 35.5S, 132E an atmospheric phenomenon or internal waves in the ocean? Views are welcome. Our new website is now live, featuring a new look, in-browser animations and easier navigation. It coexists with OceanCurrent v1.0 and until the renovations are complete you might end up back at the old site if you navigate deeply into the new one. If that happens, simply follow the link to the new site from the old home page. If you find something not working at the new site, please try a newer browser or update the browser you are using. If that does not help, please let us know the problem, and what browser and platform you are using, and use the menu-bar link to the old site while we fix the new one. We hope you enjoy the look and additional features of the new site. Feedback is welcome. We are nearly ready to go live with our new look. Let us know if you would like to participate in the beta-testing. The data holdings at EMII are constantly growing and being revised. Today we finished a routine re-scan and re-plot of all the glider data, partly in preparation for the upcoming, larger, task of re-plotting all the SST imagery with gliders and other IMOS in-situ data overlaid. We now have new map series for Brisbane-Sydney and eastern Tasmania and are gradually generating all the images and animations for them. 2012-2015 are now done for Brisbane-Sydney, for which we are using the new (fv02) versions of the L3U SST product, and overlaying the newly re-processed Coff's HF radar data, glider data and current-meter data (as well as drifters and Argo of course). If this all goes well we will soon re-generate all the graphics for all other regions. Production of the multi-day-average SST imagery stalled over the Christmas-New Year break. This outage affects our large-area graphics products and the outer-zoom level of the Google Earth imagery. We hope this may be rectified next week. 14 Jan: Fixed. Just in time for the Sydney-Hobart yacht race, we have been able to resume publication of satellite data in kml format. These files are viewable in Google Earth (or similar applications), allowing the user to overlay data from other sources (such as the positions of yachts) on our imagery. What's new? We used to step through the satellite imagery overpass-by-overpass. This showed great detail in cloud-free areas but was very slow to load up because there are so many files. So we have switched to fewer images, each with data from several satellites. These are the L3S 1-day composites produced by BoM for IMOS but you only see these when you have zoomed in on a small enough region. When you are zoomed out, you will see the 3-day composite images (the longer interval means fewer regions unseen through cloud). Velocity estimates from altimetry are also only shown once you have zoomed in. Why do we show the anomaly of temperature, rather than the actual temperature? Because a colourbar stretching from 5°C to 30°C would be too broad for local structures to show clearly. As well as allowing use of a compressed temperature scale, showing anomaly also answers the question of whether the water is warmer than usual or not. Update: we have now finished a revision of the gliders page, and activated regular updating of both the Seaglider and Slocum glider plots. Site navigation is also improved. To dive in, start at the Notes page. Positions of the gliders can also be seen relative to ocean current features at the satellite imagery pages. For example, the image for Tasmania on 23 November shows a Slocum glider crossing a cold north-flowing current to reach the edge of warmer East Australian Current waters offshore. We have now finished a first version of a suite of plots of all the IMOS ANFOG Slocum glider and Seaglider data. To dive in, start at the Notes page. Apology: we haven't yet added the tracks to all the historical SST imagery, just the two most recent Seaglider missions (off Perth and in the eastern Great Australian Bight). We have now plotted all the Deep Array ADCP data, and re-plotted all the ANMN Shelf and NRS ADCP data. See today's note on our timeseries page for more info. Geo-location of NOAA15 AVHRR SST imagery has had some very large (up to 50km) errors since 15 July 2014 so we are re-generating composite high-resolution imagery and animations from then to the present, using just NOAA18 and 19. It is unclear if NOAA15 imagery will be usable in future. This news is on top of the fact that NOAA16 data became unusable on 5 June 2014. So we are now down to just half the number of satellites being used, which means fewer chances per day to see the ocean between clouds, and thus poorer composite images. The IMOS SRS has resumed processing and distributing MODIS data (from a CSIRO thredds server), now that problems at the NCI have been overcome. We have generated our standard suite of graphics so the archive is now complete. The archive of Australian National Mooring Network data is growing and growing. The data-processing and our plotting of that data has also been improved. See today's note on our timeseries page for more info. The IMOS SRS facility recently found and corrected a bug in the CAPS software used at BoM for processing the raw AVHRR data downlinked directly from the NOAA satellites. The result is that the geo-location of SST images is now (since 13 Sept) much more accurate and precise (although the timeliness of the high-precision view-angle solver is still occasionally an issue). The last month's high-resolution animations are noticeably more stable, making the movement of ocean features easier to see, especially for the most zoomed-in regions. Cryosat-2 has just resumed operating after a 10-day outage (its first). Jason-2 suffered a similar-length outage in early September. After a long outage due to problems at the NCI, the IMOS SRS is now about to resume production of MODIS chlorophyll-a imagery. The processing system has been updated to SeaDAS7.0, which includes the latest calibration, so the chlorophyll estimates are quite different to the SeaDAS6.0 estimates produced earlier. problems at the NCI have been continuing, so updating has not been regular at all. Its being worked on, but the immediate problem is the federal shut-down in the US. Recovery from the shut-down is still incomplete, as is resolution of infrastructure problems at the NCI. IMOS Seaglider 516 seemed to be on track for an orderly recovery somewhere close to Jervis Bay last week. Its ability to glide across a strong ocean current was being used to the full to get it out of a warm core eddy off southern NSW. Suddenly, however, the battery voltage dropped faster than expected, making glides to depth in a chosen direction impossible. Disabled, the glider drifted at the surface with the current, being pushed back towards the centre of the eddy by strong winds that also made recovery impossible. Faced with the very real possibility that the glider would follow a nearby satellite-tracked surface drifter off into the Tasman, NSW-IMOS elected to charter a fishing vessel and make an overnight trip out to the glider as soon as conditions were suitable. The strategy paid off and the glider was retrieved early in the morning, 130nm from shore as shown at right (click to expand). Further to below, comparison of the ANMN mooring current velocity data with the ACORN radar estimate [e.g. Coffs, 18 Jan 2013] shows some discrepancy in the directions. As mentioned earlier, the Jason-1 altimeter fell silent on 21 June 2013, having long-outlived its design life. It provided us with an 11-year record of the heaving ocean surface, following on from its predecessor Topex/Poseidon, then working with its successor Jason-2 in an optimised tandem mission until October 2011 when it was manouvered into a safer 'graveyard' orbit from where its gradually-changing ground-tracks could scan the globe for undiscovered bathymetric features while also returning valuable information about ocean currents elsewhere. The mission engineers have concluded that the transmitter has failed and cannot be restarted. The satellite could still respond to commands, however, so an orderly termination of the mission was carried out on 1 July. FFI: [AVISO Jason-1 page] [e-mail detailing Jason-1's final days]. Much of the IMOS data set is only available in delayed time, but OceanCurrent does not yet have an automatic process for updating the archive of prepared graphics. Today, we completed a refresh of how the ANMN ADCP data is shown here (see earlier announcement). Comparison of our updated and earlier summary pages shows that many new data files have become available since March. Most of those are for late 2012, understandably. See also: highlights of the new data. As mentioned earlier, the Indian and French space agency joint SARAL mission was successfully launched in February 2013. The quality of the data is evidently very high so we are very pleased to be able to use it from today in our analysis system. This is much earlier than anticipated, which is just as well, because (the now very old) Jason-1 satellite experienced a major problem on 21 June and is not telemetering any data. The appearance of the Sea Surface Temperature regional maps (SE, SW ,GAB, etc) has recently changed because we have commenced using the IMOS L3S 3-day composite product. The IMOS SST data files are produced at the BoM from NOAA AVHRR data downloaded directly from the satellites by a consortium of Australian agencies [details], and differs from the (legacy) CSIRO product because the compositing, quality-control and calibration procedures are all new. In particular, the L3S is produced as night-only and day-only composites, to retain information about the diurnal variability. We have chosen not to show the day and night data in separate panels, however, but have merged them to produce an image with as few gaps as possible. Night-time data is more representative of the temperature at depth so we use this where available, then fill as many gaps as possible using the day-time data. We are still experiencing connection problems with the AODAAC server, in which case the legacy CSIRO product is shown instead, as happened today. Coincidental problems with IT infrastructure at BoM, NCI and CSIRO (two sites) are preventing our updating of all forms of SST imagery as well as the chlorophyll imagery. High res-SST are now updating. composite SST images are now updating. The only remaining problem is now at the NCI, where chl-a imagery is stored. Due to ongoing IT infrastructure problems at the NCI, we have been without updates of MODIS imagery for the last month. This is now fixed, and our plots are now up-to-date. HF radar data for 2013 has been added, too. We noticed a fairly severe problem with the incoming Cryosat-2 along-track sea level data yesterday. The cause of this has now been identified by the ESA and RADS teams, and the data has been re-issued (details). We have re-made our sea level maps for April 13 to 18 but will not re-make all other downstream products, especially since another re-processing may be imminent, because Jason-2 data has become very gappy. NOAA (RADS) and CNES investigated the shortage of Jason-2 data while Australia slept, and have identified and corrected the problem (details). Our supply of real-time high-res SST has been intermittent for some time, so our maps are not updating as frequently as usual. A new L3U data-coverage monitoring system has now been established. The availabilty of good SST data is shown for a number of regions around Australia, for the last 30 days. The analysis is repeated three times a day. In the upper panel, red indicates high data density while blue can mean either cloudy conditions, or lack of data from the satellites. The lower panel shows the availability of data from individual NOAA satellites. The cause of the data scarcity has now been found, but it will be 24-48h before the supply of data returns to normal. Rottnest Island, 18 Feb 2013: A sub-mesoscale cyclonic eddy reaches the 1000m isobath, traceable back to the larger cold feature between 113E and 114E on 9 Feb.
SA Gulfs, 2 Mar 2013: strong northwestward flow leading to the big upwelling event discussed in the 6 March 2013 news item. Coffs Harbour, 2 Feb 2013: an intense cyclonic eddy inshore of the EAC, with localised coastal upwelling and northward shelf flow. A bigger-picture view 30 Jan.
Capricorn-Bunker Group, 6 Feb 2013 strong northwestward flow apparently associated with a cyclonic rotation centered over the Marion Plateau (23S 153E) seen in altimetry. Under IMOS, an unprecedented number of Acoustic Doppler Current Profiler moorings have been deployed in Australian continental shelf waters. The data availability for each location (summarised in 6 pages spanning two 3-year periods for south, east and west sectors) is now shown at our new time-series page. The quantity shown on the data-coverage summary pages is the magnitude of the depth-average velocity. By clicking on those summary pages you can see page-per-deployment plots of the velocity and backscatter profile data, and timeseries of the bottom temperature, tilt and depth. To complement these time-series views of the data, arrows depicting the layer-averages of all these ADCP velocity data have now been added to many of the regional maps (for 2011-2012 so far). Some highlights of what the ADCP data reveal about the ocean are discussed in a Ocean News Item. Jason-2 has just done what Jason-1 did recently, and put itself into its stable sun-pointing safehold mode. This is an automatic response triggered by a wide range of malfunctions, designed to prevent the satellite from ever becoming uncontrollable. The CNES and NASA teams are now investigating the cause of the incident, and will re-start normal functioning as soon as possible, which may be a day or a week or longer, depending on the cause of the problem. Jason-2 was re-started on 30 March but after a few hours it went back in to safe-hold. Mission engineers are investigating. Jason-2 is being re-started today using the 'spare' electronics module. There is a risk of a slight mis-calibration using this unused electronics. We will watch for a spurious height shift using our standard QC procedures: [constellation intercomparison] [ascending vs. descending track intercomparison]. Jason-2 seems to be working perfectly well, with no discernible miscalibration. Since Jason-2 is the reference mission, this comes as a big relief to the altimetry community. CNES and Thales Alenia Space have completed diagnostics of the satellite and recovery operations are nearly complete, so normal functioning is expected to be resumed by 18 March. The interupt occurred as the satellite passed through the South Atlantic Anomaly, where the density of energetic particles is very high, frequently upsetting the sensitive electronics of satellites. Jason-1 data is flowing again but is mostly being rejected by our automatic QC procedures. CNES and NASA warned us of this possibility and are working on a correction. The satellite's batteries became over-charged during the safehold, and now the payload bay has become overheated. Nearly coincidentally with the launch of SARAL, the Jason-1 satellite went in to safehold mode on 28 Feb 2013. Launched on 7 Dec 2001, the satellite is well beyond its design lifetime so it will not be a surprise if recovery of the mission is not possible. Our sea level maps are now being made using data from just two altimeters- Jason-2 and Cryosat-2 so users are advised to check the (dotted) locations of track lines. A significant ocean eddy can exist undetected in the Jason-2 inter-track spacing during the period when Cryosat-2 is sampling elsewhere. The accuracy of the sea level maps shown on this site is critically dependent on adequate sampling of the globe by the multi-agency constellation of altimetry missions. The SARAL satellite carries the Altika altimeter, which operates at a higher frequency than existing altimeters, promising to give higher along-track resolution as well as greater accuracy than previous altimeters. We will be evaluating the data from this mission as members of the international science team, of which we are fortunate to be a member. At the first opportunity, our published maps will benefit from this extra supply of data. [Indian Space Research Organisation news] [AVISO news]. 5 Mar Update: The altimeter was activated shortly after launch (on 26 Feb) and found immediately to be working as expected. Orbital maneuvers are taking place to put the satellite on 13 March in its exact orbit. 14 Mar update: Final orbit has been successfully reached. Three new rectangles on our index page take you to preliminary versions of imagery for three new focus regions. The Southern Ocean maps are centred on the IMOS Southern Ocean Time Series mooring, to help place the data from that mooring in a spatial context. The Timor Passage maps show the spatial context of the Indonesian Throughflow deep water and shelf transect arrays. Mooring data (presently up to 21 July 2012 for ITF shelf) will continue to be added to the maps. Good imagery is fairly rare for these tropical and southern regions, especially during the wet season in the tropics. Note also that spurious current velocity estimates at the Timorese and Indonesian coasts is because our sea level analysis system does not use coastal tide gauge data for those coasts. Visitors to this website will be familiar with the maps of sea level and derived geostrophic surface currents that we produce in near-real-time by combining the data from tide gauges and the radar altimeters carried by the Jason/Envisat/Cryosat-family satellites. We call this data product NRT GSLA (Near-Real Time Gridded Sea Level Anomaly). An important objective of the OceanCurrent project is to produce higher-quality versions of GSLA based on re-processed (or 'delayed mode') altimetry data distributed by the space agencies. The reprocessed data are superior to the near-real-time data for many reasons that we will not attempt to summarise here. Our first re-analysis (DM00) of these data is now complete and is available from the EMII Thredds server. Documentation outlining the methods and validation of the processing is in preparation. In the mean time, please see our poster and Conference Proceedings paper prepared for the 20 years of progress in radar altimetry symposium held in Venice, Italy in September, 2012. Plots of all the DM00 data can be seen via the [Date Index] links on the larger-scale map series, e.g. : SE region. Users will have noticed that many sections of this website have not been updating recently. This has been due to IT problems at several places in addition to ARCS. We are working to reduce the occurences of outages. HF radar and chlorophyll-a data are up-to-date today. We hope to keep it that way. An upgrade to the ARCS Data Fabric has now been completed and data is flowing again but a few issues still need to be addressed. We apologise in advance if any outages recur while these issues are being finalised. Numerous components of our data sytem have been having problems, so supply of various data streams is interrupted. We hope that full service will be restored soon. The chlorophyll-a imagery is now updating automatically, daily at 10:30-11:00am Hobart time, which is shortly after the data become available from the previous afternoon's overflight. Updating of SST imagery has been restored, as has HF radar. We hope to have updating of SOOP restored soon. SST imagery has been largely unavailable since 25 June. The IMOS SRS is aware of this and are working on it. MODIS has higher spatial resolution than AVHRR but since there are more AVHRR sensors flying, and thermal emission occurs equally in day and night, we have many more images of the ocean's temperature than its colour, which can't be seen at night. For this reason we presently show, for all the high-resolution regional plots, each image from the satellite separately, with gaps unfilled by earlier data since this is probably quite old. Large-area, time-composite images are being prepared. An initial version that uses the same technique of continuous overwriting that we use for high-res SST is shown for the whole Australasian region (reached by clicking outside the regional rectangles). May 2013 Update: The following paragraphs now also includes links to the new v6.4 images. The new colour bar starts at 0.03mg/m3 instead of 0.02 to reduce the effect of a calibration difference which is quite obvious if you look through the image pairs below for 2011-2012. The new images also include ANMN data and delayed mode (instead of the near-real time) altimetry maps. 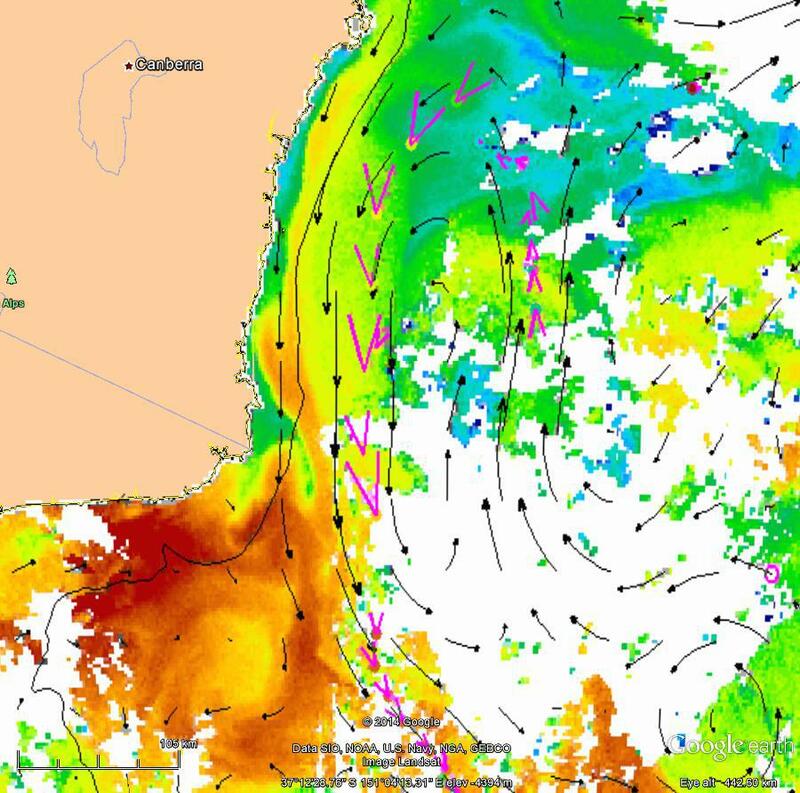 The beautiful image for 28 May 2012 off Perth [v6.4] shows that the warm Leeuwin Current water sometimes has (somewhat paradoxically, considering its tropical origin) higher chlorophyll-a concentration than the colder waters offshore. A few months earlier, however, when the Leeuwin was not yet flowing very strongly, the picture is very different. A good image for 29 Feb 2012 shows the southward-flowing warmer Leeuwin Current water having clearly lower (surface) chlorophyll [v6.4] than the shelf waters which the radar [ v6.4] sees recirculating anticyclonically over the Perth Canyon, inshore of the faster flow. Similarly, a little farther north a month earlier, we see high chlorophyll-a [v6.4] on the southern, cooler side of an offshore-directed meander of the Leeuwin Current. The positive divergence of the radar velocity estimates suggest that the high chlorophyll water is being upwelled. Moving downstream into the Great Australian Bight, a warm-water, high-chlorophyll eddy of Leeuwin Current water can be seen, by stepping backwards from 12 April 2012 [ v6.4] through 2 April 2012 [v6.4] to 12 March 2012 [ v6.4], to result from meanderings of the Leeuwin Current that eventually became an isolated eddy off the slope. The clear skies at that time also yielded a beautiful image off the Bonney Coast region [v6.4] where the ACORN radar recorded the velocities associated with another high-chlorophyll, warm anticyclonic eddy. Zooming out [v6.4], we see an interesting cyclonic eddy at 40S 136E with a low-chlorophyll centre. We can't leave SA, however, without seeing a beautiful image of a classic summer-time Bonney Coast upwelling event [v6.4] driven by a burst of SE wind driving water alongshore but also away from the coast, drawing cold water up from below, fuelling the food-chain. On the east coast, in contrast, we almost always see the usual relationship of chlorophyll [ v6.4] to temperature and sense of rotation, i.e., low chlorophyll in the warmer tropical-origin (EAC in this case) waters, or its anticyclonic eddies. The high resolution of MODIS, and the fact that sometimes there are much stronger gradients of colour than temperature gives MODIS the ability to show the ocean in greater detail than AVHRR. This is especially true off the North West Shelf, where a beautiful sequence of chlorophyll images for late May 2012 [v6.4] show rich detail associated with southwestward flow along the shelf break while the SST images for that time show the winter cooling of the coastal waters but not much else. Another example is the 24 February image for Sydney [v6.4] showing a small patch of 'green' water at about 34.3S, 153.5E where there is intense cyclonic shear between the EAC and an eddy that detached from it some time ago. Looking back through the imagery, it appears that this patch originated at the coastal bloom. The image also shows the sharp front all along the coast between the warm, low-chlorophyll East Australian Current waters (both the eddy and the parent current) and the more productive coastal waters. Images of the Great Barrier Reef [v6.4] are particularly beautiful but note that the chlorophyll algorithm is not at all accurate where the sea floor can be seen from space. This one appears to show low-chlorophyll waters flooding north-westwards into the Capricorn Channel, in agreement with the HF radar data. To finish this quick introduction to the images for 2012, we draw your attention to the (initial version, see above) large-area composite image for 20 March 2012 [v6.4] which shows the first appearance of a cyclonically-rotating, high-chlorophyll-a eddy which is clearly the legacy of TC Lua which developed off the NWS on 15 March 2012, pausing at the location where the cyclonic eddy is generated in the ocean. The bloom of high surface chlorophyll can be followed until about 13 April. Sydney-Hobart on 25 Aug [v6.4], 22 Sep [ v6.4] and 16 Nov [v6.4] showing a low-chlorophyll anticyclonic eddy off Bass strait. This eddy is derived from the record-setting eddy shed by the EAC in January, 2011. If you step through you will see a series of interactions with the EAC and other eddies in April and June-August. The last image in which it is clearly identifiable as an isolated eddy is for 6 Dec [v6.4]. The flow of HF radar data has resumed and the data are now appearing on this website. The near-real-time processing and display of ACORN HF radar data is now happening routinely every day. However, the data become available at the opendap server later than the SST imagery so you might not see any radar data overlain on the latest SST imagery. Today, the most recent radar data is for 6 June but this long delay will soon be reduced. To see the radar data, go back in time using the [PREV] link or go to the [DATE INDEX] and view the animation. Data for the radars off Perth, Adelaide, Coffs Harbour and Gladstone have been plotted back to 1 January 2012. The time-averaging of the radar data, and colour-coding of the surface current vectors is chosen for each panel to be appropriate to the region and the map scale. For the maps showing the closest views of each radar, the vectors are shown in three colours, depending on whether the radar velocity field at the base of each arrow is divergent, neutral (|div( v)|< 5E-6/s) or convergent (see key). On other maps the vectors are either red or blue, whichever contrasts best with the SST background. The time averaging is described in the key as a range, e.g. 4-12h for Rottnest, signifying that each point of the radar velocity field is the average of at least 4 1h-averaged values within a 12h interval centered at the time of the SST image. The lower limit of 4 in the average is a simple way of detecting poor data quality. The purpose of the long upper limit (12h) of the time-window is twofold: 1) to reduce the influence of tides, and 2) to increase the chance of finding radar data to include on the SST image. At Coffs, however, we use a shorter time window (2-4h) for the same reason a sports photographer uses a fast shutter speed: velocity structures often advect through the radar field so fast that using a 12h time-window blurs all the detail. The time-averaged velocity field is shown as curved arrows using the same technique we use for the altimetric velocity field, which is to compute Lagrangian trajectories of particles over a chosen time interval. This time interval is shown in the velocity key of each panel. It is 24h in some and 12h or 6h in others depending on whether strong currents prevail in the region, and the spatial scale of the map. The advantage of this technique is that a single arrow shows information for many locations. It is also valuable for communication, because a particle path is a more tangible concept than a velocity expressed in m/s. Because of the inclusion of the radar and mooring data, we have now changed the Lagrangian interval for several maps from 24h to 12h. This was because 24h-long paths are often longer than the area spanned by the Coffs radar, resulting in an incomplete path. We have also changed the established practice of only saving a graphic image if the latest SST imagery has at least 7% coverage, since even this low quality criterion results in long gaps due to persistent cloud, preventing plotting of the radar (and other) data. Images are now saved even if the SST image has only 3% new pixels. Thanks to IMOS, there is now an unprecedented array of measurements being made of the properties of the ocean around Australia. We are now adding more and more of these new data types to this website. Today we have added a small graphics panel for the Coffs Harbour region, where the IMOS ACORN facility has installed a WERA radar that measures the surface current velocity from the coast out to 100km at times. These data are new and need some re-calibration (especially south of about 30.7S) but already it is clear that the correspondence of the radar data with SST imagery and current meter data is good. For example, the radar, SST and ADCPs all agree that on 30 March 2012 the East Australian Current was taking a detour around a mass of colder, probably-upwelled water that started to occupy the continental shelf nearly a month earlier. 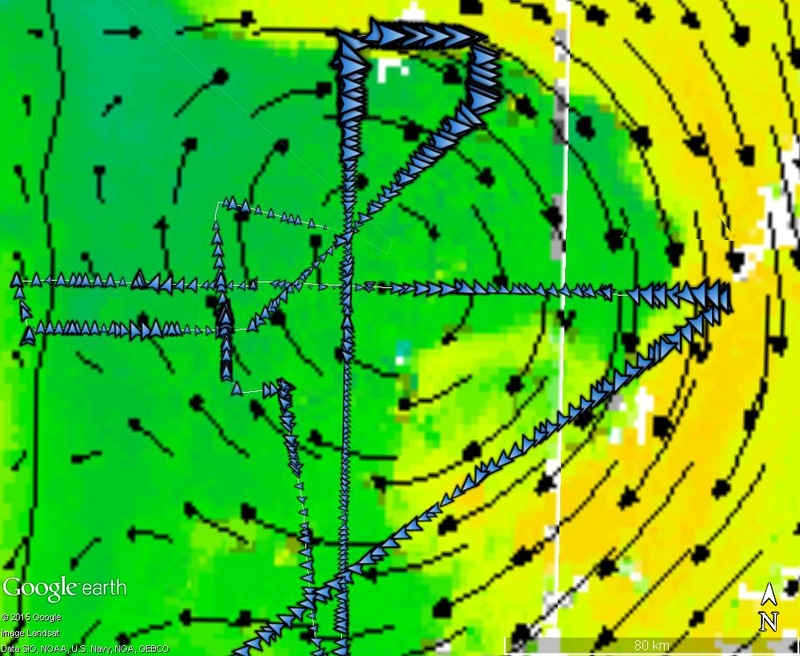 The EAC subsequently reasserted its dominance during the next week, when a small cold core cyclonic feature was swept over the mooring array on 1 April 2012. The Acoustic Doppler Current Profiler current meters were installed by the IMOS ANMN facility. Off Coff's there is one on the 70m isobath and one on the 100m isobath. The ADCP measures the current speed from near the bottom to about 15m from the surface. Here, we compute averages within a 4h time window for three depth ranges that are shown as three differently coloured arrows (see key). The length of these vectors is directly comparable to the curved trajectories but remember that differences can be expected between the subsurface ADCP data and the surface radar data, and between the ADCP point measurements and the altimetric average over ~50km. Re-tasking of the Jason-1 altimeter has taken NASA and CNES a little longer than hoped, and nearly ended in the loss of the mission. Thankfully, however, the satellite is once again producing good estimates of sea level anomaly and today we produced our first map (valid for 20 May) that included this data in addition to the Jason-2 and Cryosat data. As mentioned in the 11 April item below, Jason-1 is now in a different orbit. This is necessarily unsynchronized with Jason-2, and does not result in the same ground-tracks being regularly resampled. The former orbit was carefully chosen to provide optimal complementarity to Jason-2. The new orbit will result in a more uneven data density, resulting in an uneven, and varying level of accuracy in the final map. Perhaps more importantly, the consequence of being in a non-repeat mission (like Cryosat) is that occasionally the satellite will discover new seamounts because of the effect these have on the Earth's gravity field and hence the equilibrium shape of the sea surface. Unanticipated, however, some of these signals will be indistinguishable from sea surface anomalies associated with ocean currents, thus causing spurious features in our maps of the flow. There is an upstream problem with the SST data files required for updating some of this website, so some maps are stalled at 11 May. The high-res imagery viewable by Google Earth is updating normally. The large-area maps stopped updating on 16 May (for an unrelated reason) but this has been fixed today. BoM identified and fixed the problem yesterday, restoring the flow of data, so this morning's update of this website proceeded normally. The gap in the image archive will be filled. The gaps are now filled, except for the odd day, eg 21 May. Follow the [DATE INDEX] link on any of the single-pass SST map series (e.g. : LordHoweS) and you will find animations for each month for the whole archive of existing high-res graphics. NB: many of these will soon be revised, with IMOS data added. : Use animation editing software like FastMovieProcessor to make the animations just the length you need, by adding a few of these together. A good way to import them to PowerPoint is to save as an avi (select MS RLE encoding, quality 100%, data rate 3000kb/s, 12 fps) then in Powerpoint you can use Insert Movie. NB this inserts a link, not the animation, so keep the avi file in the same directory as the ppt. We apologise for making yet another change to our URL, but it has been unavoidable. No more changes are anticipated, so feel free to bookmark this one. We hope no-one bookmarked the recent temporary 'oldportal' URL. The original imos.aodn.org.au/oceancurrent will re-direct to the new URL but its better to update your bookmark. During the transition, you might have noticed that access to the archive of Google Earth-viewable imagery was interrupted. This has now been fixed.
) ESA has lost hope of recovering control of the satellite and has announced the end of the mission). Launched in 2002, it is well past its design lifetime, and operating in a mission follow-on mode in which it does not continuously re-sample the original ground tracks. The consequence for us is that we are now down to just two altimeters: Jason-2 and Cryosat, since Jason-1 (also past its design life) is still in safe-hold, a mode in which the satellite remains controllable, but does not make observations. A series of malfunctions have occurred recently so NASA and CNES are likely to put Jason-1 into a slightly lower orbit so that if it does fail completely, it won't become an uncontrolled navigational hazard for Jason-2 and future Jason-class missions wishing to occupy the same orbit. Data from the new orbit might become available in May. The accuracy of our maps of sea level and geostrophic currents will be significantly less (on average) with only two altimeters in use compared to when we were using three or four. The sampling pattern of Cryosat is unlike that of other altimeters. The result now, with just two altimeters available, is that the accuracy of our maps is very variable in space and time. So please pay attention to the density of the track lines. The next altimeter mission, due for launch this year, is the CNES-ISRO SARAL satellite, carrying the AltiKa altimeter. Several merchant vessels have been equipped with instrumentation as part of IMOS. The temperature data are now shown on our maps of high-res SST as a line of colour-filled black circles, eg: [ship passing Sydney near two Argo floats]. A few computers have been replaced recently, causing various problems which have now been addressed. Our URL had to be changed to a temporary one: oldportal.imos.org.au. Don't bookmark it. Rely on the redirection we are providing. Updating of all high-res SST maps has resumed, and the error rejection has been notably improved. The Google Earth viewable imagery is available again, but only for April 2012 onwards. Access to old images will be re-instated after Easter. 4 March 2012: Cryosat data processing fixed, but Jason-1 data still missing. The problem with Cryosat (which showed up as a 20cm difference between ascending-pass and descending-pass estimates of sea level - see our ongoing monitoring) was traced today to a 4ms timing error in the orbit data processing. The data stream distributed by NOAA is now fixed, so today's maps are improved. We will re-make recent maps using the corrected data. 1 March 2012: Only two altimeters working - so our sea level maps are suffering. To maximise the use of the latest altimetry data available from NOAA (see 9 Dec news), we've delayed the start of our sea level analysis slightly. It finished today at 22:14Z (09:14am EDT), about 2h later than it used to, but this should be thought of as 22h earlier. The latency of the nominal date of the analysis is unchanged but the distribution of data within the data window is now more symmetric, effectively bringing the map closer to real-time. Users doing scheduled downloads of digital data are advised to do so at 2230Z (9:30EDT). The large-scale plotting of SST will commence at this new time. The high-res plotting will now be done twice each morning: an early update to show the latest night-time images, then a later update using the latest estimates of currents from sea level. Today's sea level analysis (valid for 4 Dec 2011) is our first to include data from the ESA CryoSat mission. The CryoSat mission is principally focussed on the cryosphere, but its radar altimeter is also capable of measuring fluctuations of sea surface height like Envisat, Jason-1 and Jason-2 do. Thanks to the efforts of several key individuals at NOAA Laboratory for Satellite Altimetry, CNES and ECMWF, we now have timely access to accurate estimates of sea surface height anomaly derived from CryoSat data. The sampling pattern is unlike the other altimeters: two weeks of sampling yields groups of closely-spaced tracks. Jason-1 and Envisat are both past their design lives so the value of the CryoSat data will suddenly increase when either of the older satellites fails, at which point we will be even more grateful to the CryoSat project team for making the data available for purposes beyond the core ice mission. We are switching over now to using the IMOS SST data products. The zoomed-in maps (left-hand map series) will be updated from now on using the L3U data product. One benefit of using the L3U is that we can now produce high-res maps and animations for more regions around Australia. Browser requests to http://www.cmar.csiro.au/remotesensing/oceancurrents/ will be 301 redirected by the CSIRO server to the new IMOS address. Updating your bookmarks and hyperlinks will avoid a dependence on the CSIRO machine. The data files of gridded altimetry are now available via OPeNDAP. See the 'Access to data files' heading. The initial round of changes to the existing website are now complete but we are not quite ready to shift the site to the new IMOS address which presently only shows a subset of all the content. We've found we can resume using Jason-1 data if we use the less-rapidly delivered version of the data, which seems not to be degraded, so the maps are much less-affected by the manouvers than if the data was not used at all. Jason-1 is close to being de-commissioned and has to burn off its reserves of fuel. The resultant changes to its orbit are causing errors in the orbit tracking, flowing through to errors in the estimates of sea-level. We are consequently withholding Jason-1 data from the sea level analysis until the fuel burning is complete (16 October 2011), which will mean that the sea level maps and geostrophic currents will be significantly less detailed for the next few weeks, but hopefully free of major errors such as the one that caused this large disagreement with Argo. [Jason-1 withheld]. We are very pleased to give notice that this website will soon (September) move to IMOS. Numerous improvements to the site will be made, as you will see. Continuity of service will be a high priority during the changes and upgrades. If something looks broken, reload the page, or wait a bit. 25 August 2011: Southern Surveyor heads out to study the oceanic larval stage of Western Rock Lobster. [Images] will be sent regularly to the ship so the scientists (led by Prof Anya Waite of UWA) can choose where to sample with respect to ocean features such as fronts, warm or cold eddies. The sea level maps are presently featuring some long ridges of (~20cm) high sea level that are due to errors in the incoming data (from the satellites or one of the auxilliary systems) that are too small to be detected by the automatic quality control. This may not be corrected, unfortunately, for several weeks. 17 December, 2010 Unattended over Christmas. The computer systems that update this website will be unmonitored and unmaintained from today until mid January. If there is no power outage everything is likely to keep running. Apologies for any inconvenience if any systems fail to keep running. Please also note that we are now down to just two altimeters since no data is presently arriving from Envisat. Our maps are therefore more likely to be missing or misplacing features of the flow. Envisat, one of the three altimeters upon which we rely for mapping sealevel and geostrophic currents, is no longer remaining in a repeating orbit. See the ESA website for details. This means there is an increased risk of erroneous features occuring in our maps. Only gross errors will be trapped by our QC procedures. Users should, as always, look for consistency of the SST and altimetry information in order to assess the errors of the maps. A major limitation of satellite altimetry is that sea level and ocean current maps made directly from it are valid for several days in the past, rather than just hours ago. Part of that latency is the time it takes for the satellites to cover all points on the globe. Another contributor is the time it takes for all the ground-segment computations to occur. It used to take several months to achieve the level of accuracy that is now achieved operationally in just a few days. Just recently, JPL announced availability of a new Jason-1 data product (OSDR-SSHA) with the same very-short latency of the Jason-2 GPS-OGDR. Inclusion of both these data products in our mapping has significantly improved the accuracy and timeliness of the maps. The histograms of data availability are your way of monitoring the amount of data going into the maps, a key factor in the resulting accuracy. Glider 109 retrieved after sampling the eddy. It travelled 710km in 23 days and made 1900 dives. With the intercalibration with Jason-2 now complete, Jason-1 has been moved into a new orbit so the ground tracks interleave those from Jason-2, giving more observations so our maps can be more accurate. The last time there were two altimeters in an interleaved orbit was October 2005, the end of the Topex/Poseidon mission. The question now is how much longer Jason-1, launched in December 2001, will last. this website will be unmaintained for a longer-than-usual period this summer while staff are on leave. The systems should all continue working unattended but outages may occur. We apologise in advance for any interruption of service. We also apologise for the degraded accuracy of the velocity maps. This is a consequence of there only being two altimetry satellites useful for inclusion in the maps, rather than three or four in recent years. A return to three is scheduled to occur in early February 2009, when Jason-1 moves from inter-calibrating to interleaving Jason-2. November 26, 2008. IMOS Slocum Glider 109 ('Nemo') launched. Mission: to circumnavigate the warm-core eddy off [southern NSW], then return to the coast. [Australian National Facility for Ocean Gliders] [Nemo kmz]. November 21, 2008. Apology for outage. Sorry about the non-updating of this website over the last 2 weeks. We have been at an altimetry meeting and a software problem occured here. ). If the up-coming Sentinel and Jason-3 missions are cancelled, this web site will cease to update when the existing Envisat and Jason satellites end their missions. June 20, 2008: Launch of Jason-2 (OSTM). Two brave souls paddle across the Tasman Sea, with a little help from the East Australian Current and our maps of it. Ocean Forecasts (currents, sea level, subsurface temperature, etc) become publicly available in Australia for the first time.